The Refurbishment of the Irish Master's Cloak. On Thursday, 6th September 2001, V.W.Bro. David McCutcheon, P.M, Past Senior Grand Warden of the Provincial Grand Lodge of Antrim, presented to the Lodge of Research CC the refurbished Master's Cloak shown in the attached photograph. The refurbished Master's Cloak was originally presented to the Brethren of St. Patrick's Masonic Lodge No. 216, Carnlough, in the County of Antrim, Northern Ireland. 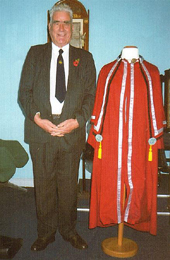 This Cloak had been repaired, refurbished and restored to its original, pristine condition under the watchful eye of V.W.Bro. David McCutcheon. Some of the younger, and maybe some of the not so young Brethren might wonder what it was for, and to answer that question we must go back some 200 years to the early part of 1809, when £3.15s.9d was expended by the Brethren working in Carnlough, under Seton Warrant No. 653, to purchase a "scarlett Morion, White fur fringe and blue stuff for a cloke". Now that was a large sum in 1809 and it was spent to ensure that their Master was suitably clothed to lead his Brethren to the annual St. John's Day Church Service in Carnlough, Glenarm, Cairncastle, Larne or maybe even Cushendall.